Occupation: Dentist, Team Bodybuilding.com and Gaspari Athlete. Today, we're making my rice paper shrimp rolls! This recipe is awesome because it's going to give you a guaranteed "bellygasm." It's also super quick and easy—it only takes two minutes! News flash: You don't need to spend two hours in the kitchen every night to have an eight-pack! If you're not into shrimp, you can easily swap it out for chicken or tilapia—it'll just take extra step or two to make. Moreover, if you like making your own guacamole, more power to you! There aren't any rules that say you have to buy everything pre-made. So grab a plate and get started. I'm sure you'll like this recipe so much you'll add it to your "super awesome recipes" collection. Organize everything in advance. Because rice paper is time-sensitive, you'll have to hustle to make these rolls. 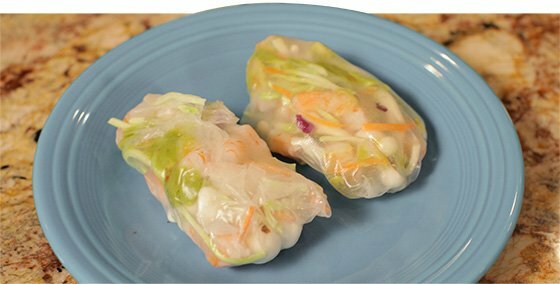 Rice paper doesn't add much nutritional benefit, but it is a gluten-free and low-calorie way to make your clean eats more like cheat food. I like to use Enoki mushrooms instead of miracle noodles for filling because they offer extra nutritional benefit. I purchased pre-cooked shrimp because I'm lazy and I want to eat right away. You can do the same!